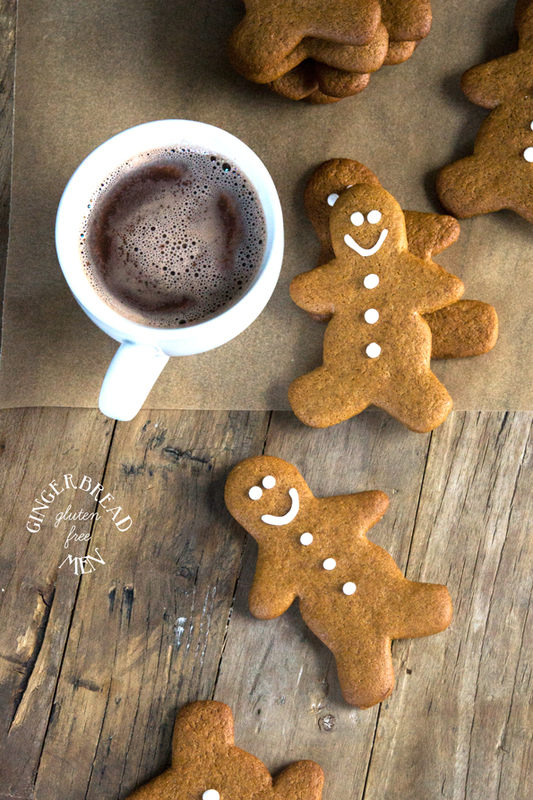 Crispy Gluten Free Gingerbread Men Cookies | Great gluten free recipes for every occasion. Crispy and snappy gluten free gingerbread men cookies, spiced with cinnamon and ginger, and flavored with just a touch of molasses. Make them any shape you like! 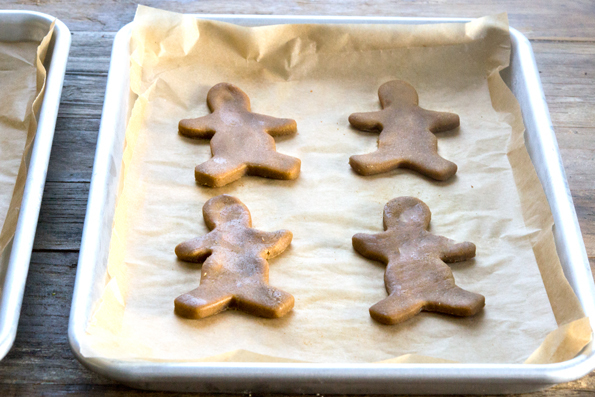 What’s a plate of gluten free Christmas cookies without … gluten free gingerbread men? This time of year, I am bursting at the seams with new gluten free recipes for you—especially gluten free cookies. I feel like there aren’t even enough baking days before the holidays for me to squeeze in everything I want to tell you and show you. It’s a nice problem to have, all around. 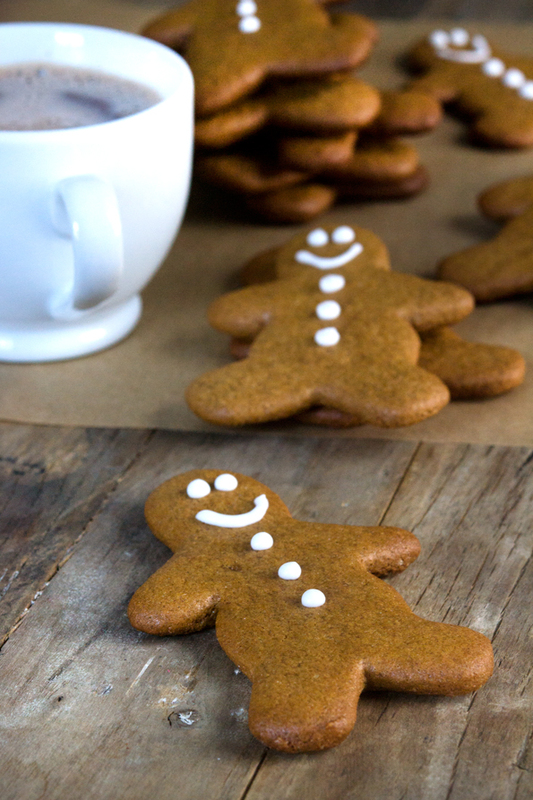 A couple years ago, I posted a recipe for dairy free vegan gluten free gingerbread men, so if you’re dairy free or vegan, go for those! But I have to say, I prefer these little guys. They’re snappy without being fragile, and I appreciate that in a man. Even if he is naked, except for those few buttons. They’re lovely with a cup of tea, but I am partial to a nice, hot cup of homemade hot chocolate. Ooooh or egg nog. Oh egg nog is just the living end for me. 1. Roll them thick (about 3/8-inch, as explained in the recipe). They’ll be very stable cookies, and they’ll still bake up snappy. 2. Bake them until they’re dry to the touch, at a relatively low temperature (325°F should do it). 3. Make them wave to each other before you bake them. No one else will know, but it’ll be fun for you. And anyway I’ll know. They spread a wee bit during baking, so don’t bake them too, too close to each other. Ice them with a little face, or leave ’em au naturale. Either way, ’tis the season … for cookies!! In a large bowl, place the flour blend, xanthan gum, cornstarch, baking soda, cinnamon, ginger, salt and granulated sugar, and whisk to combine well. Add the brown sugar, and whisk once more to combine, working out any lumps in the brown sugar. Create a well in the center of the dry ingredients, and add the molasses, honey, vanilla, butter and egg, mixing to combine after each addition. The dough will be thick and smooth, and somewhat sticky to the touch. Transfer the dough to a large sheet of unbleached parchment paper, cover with another sheet of parchment and roll into a rectangle about 3/8-inch thick (more than 1/4-inch, less than 1/2-inch). If you are concerned that the dough will be difficult to handle, place it in the refrigerator or freezer after you roll it out to allow it to firm up. Dip a gingerbread man cutter in all purpose gluten free flour or cornstarch, and use it to cut out shapes from the cookie dough. With each cut, jiggle the cutter back and forth to create a neat shape. Peel back the rest of the dough from around the cut-outs, and carefully peel off the men and place them, about 1 1/2-inches apart, on the prepared baking sheets. Gather and reroll scraps, and repeat the process until you have used all the dough. Place the cut-outs on the baking sheets in the refrigerator or freezer until firm (about 20 minutes in the refrigerator, or just 5 minutes in the freezer). Place in the center of the preheated oven and bake until dry to the touch (about 15 minutes). Remove from the oven and allow to cool completely on the baking sheets. They will crisp as they cool. P.S. I hope you’re beginning to get the hang of the new gluten free bread. Bakes Bread is my love letter to you! These are amazing! It was soo great to be able to join in the Christmas cookie fun and eat the dough (oops) along with everyone else. Great recipe!!!! My not quite two year old grandson has to be gluten free now too, so what fun we had making gluten free cookies together. When he comes to grandma’s house there’s no danger of gluten lurking anywhere. We used the gingerbread man recipe and made gingerbread dogs. They were perfect and did not last very long. Thanks, Nicole! I really enjoyed these and my guests ate almost every single one this weekend! I did find they were very sticky when I was cutting them out. I tried your fridge trick but they were still too sticky to retain their cute gingerbread man shape when I transferred them to the baking sheet. I put a little flour under and on top of the dough and then rolled them out. That really helped and it became a fun recipe again. These will definitely be a holiday staple in my house. Thanks so much!! Next time, Laura, try rolling them thicker than you did. My guess is that you tried to roll them thinner than 3/8-inch thick (which, as you can see from the photos, is rather thick). The molasses and honey in these cookies makes them too sticky to roll thin, and also makes the temperature of the dough very important! Hi, I just made these cookies and I love the flavor. They did puff up and look more like Michelin men than gingerbread men, but I think longer in the freezer will fix that. Question for other gluten free bakers out there. I find many gluten free cookies too sweet for my taste. Does anyone have a solution for decreasing the amount of sugar without having a negative effect on the texture (ratios to change / just decrease the amounts / other)? Melody, especially with cutout cookies, I’m afraid you can’t just reduce the amount of sugar and get the same results. It’s not just for sweetness – each type of sugar has different chemical properties and affects the chemistry of the dough as it is shaped and bakes. You would have to alter a number of the other ingredients as well. Yes, exactly. I figured someone with more food science experience may have some tips. I guess I’ll just have to try various tweaks of ratios or possibly a less sweet sweetener than sugar! On a quest. Any thoughts people may have would be welcome. Thanks and Merry Christmas All! These are amazing cookies! I love how puffy they are when baked. 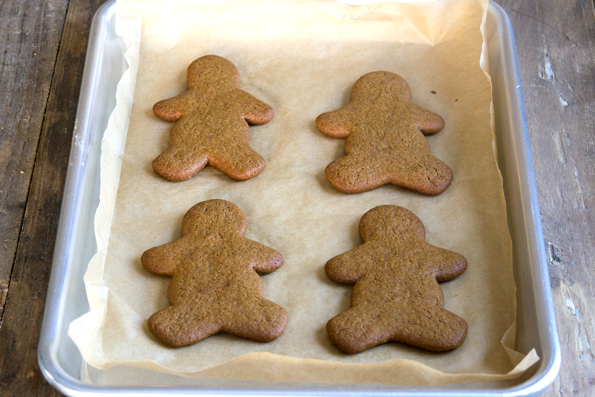 I made gingerbread boys and yup I did have them give each other a lovely little wave before going on the pan. I did find that even using the parchment paper doing a light sprinkle of powdered sugar under and on top of the dough made it amazingly easy to move from the parchment (after chilling the dough 15 mins in the freezer). They ARE awesome with a hot milky drink (coffee, tea or cocoa!) Thanks for this lovely gift! Lisa, as you guessed, it was the fact that he used melted butter. Using melted butter instead of room temperature butter will have quite a dramatic impact on the end result. That is why I am so specific at each stage of the recipe about what the temperature of the ingredients, and then the dough, must be. Can I use this recipe to make ginger cookies that you roll a ball and bake? Hey Jody–I actually rolled the last little bit of scraps in to balls– I made the balls dipped the tops in raw sugar and then put them on the pan and squished them flat to just a bit more than a 1/4″ thick. they puffed up and the edges even smoothed out a bit. Thought you’d like to know! These look so snappy and tasty! Can’t wait to try them out! Thank you so much for this I have been looking for gingerbread cookies recipe! Greatly appreciated! I’d never made gluten-full pita bread so I wasn’t sure what to expect at all but I think it turned out pretty nice for a first try. Jennifer it’s AWESOME! I have so loved hearing and seeing your updates as you make your way through the book. Keep ’em comin’! I just wanted to pipe in to let you know how much I LOVE your new bread book. It was delivered yesterday, and I have been devouring it!!! And thank you, thank you for letting us know how to modify your recipes for dairy-free versions. My poor husband cannot have gluten, dairy, nut, or potato ingredients, so bread items have been limited to rice muffins. Not anymore! Woohoo!!! (I’ll use cornstarch and sorghum flour for the potato ingredients) Tiger Rolls for supper!!! And sourdough bread will be on our Christmas menu. Many, many thanks! I just wanted to pipe in to let you know how much I LOVE your new bread book. It was delivered yesterday, and I have been devouring it!!! And thank you, thank you for letting us know how to modify your recipes for dairy-free versions. My poor husband cannot have gluten, dairy, nut, or potato ingredients, so bread items have been limited to rice muffins. Not anymore! Woohoo!!! Tiger Rolls for supper!!! And sourdough bread will be on our Christmas menu. Many, many thanks! Thank you so much for the kind words about the bread book. It really sounds like you have become quite good at navigating around your husband’s dietary restrictions. He’s one lucky man! Okay Donia, I almost spit coffee on my monitor after reading your comeback! Still laughing! Nicole, YUM! Oh, now I want egg nog! No one in my house likes it but me. Maybe they will like your homemade egg nog though — because they absolutely love anything I have made from your books/recipes so far. I just do not understand these no-egg-nog people, Mare. It just doesn’t add up for me. Egg nog is so heavenly! yummy yummer-son. Thanks for another c-cookie recipe to add to my arsenal! Happy holidays!!!! Would this recipe work to make a gingerbread house? Nothing too big or fancy, just a little cottage, maybe with a chimney? If I rolled the dough thicker would it still be as snappy, or do I have to also adjust the cooking time then? Thanks! Hi, Emily! They would totally work to make a house. The cookies are super sturdy. The only thing to keep in mind is that they do spread a bit when they bake, so your sharp edges may round a bit. If you make them into larger squares, just increase the baking time (but NOT the temp) until they are dry to the touch. And bake like-sized pieces together, or you’ll overbake some and underbake others. But the dough is perfect for a house. As long as you don’t plan to live in it. And thank you so much for the kind words about my answering new book questions. In the Live Q&As, my rule is to answer the same question fully twice, and then, in the next instance I refer people back to the answers above or the time is up and I haven’t gotten anywhere! Thanks for noticing. :) Truly. I’m so glad someone asked this question. I have a 16 y/o autistic daughter who is GF. I make gingerbread houses for the kids every year but she can never eat hers. I’m going to try this recipe this year. Thanks SO much!! This is definitely going in the books as one of the snappiest blog posts (with comments) ever. I have a gingerbread man molded pan. Do you think this would work for that? I bought it ages ago and haven’t used it, and don’t know what to do with it! They’re going to have gingerbread men at my daughter’s school on Friday, so it would be nice if she had one of her own! I responded to your question on Facebook, Barb. It sounds like you’re looking for a cake. I have a recipe for gingerbread cake and one for chocolate gingerbread cake on the blog. Just use the search function.